Does the thought of olive oil in ice cream make your nose wrinkle? Before this past weekend, that was my experience but having used olive oil in cookies and cake in these past months, I was feeling more adventuresome. Check out olive oil recipes online and you will find them all pretty much the same. Jenny’s recipe at Nourished Kitchen (here) stands out as more nutritious, so that was my starting point. While we all love ice cream and watch our nutrient intake, I am especially conscious of what the little guys are getting. It’s so satisfying to see them working their way through mounds of ice cream, knowing that the ice cream is stacked with health benefits. Use the best ingredients you can manage. We had a bottle of olive oil from Mountain Rose Herbs, saved for a special occasion. This was the occasion. If you do not have access to fresh pastured eggs (like from your own hen house), then do plan to cook the yolks in the milk like a custard before cranking up the ice cream. 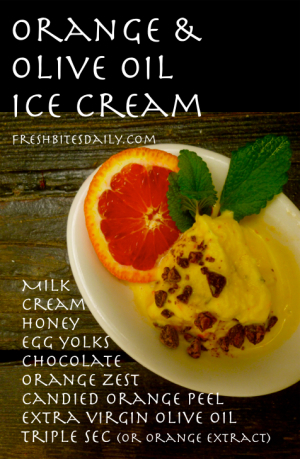 (Read more about raw egg safety and how to pasteurize your yolks for ice cream). For sweetener I used local honey, purchased to help the boys fight allergies in the spring. Use whatever sweetener works for you and your dietary specs. 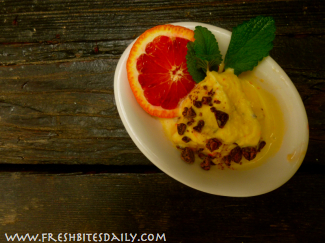 Jenny flavors her ice cream with blood oranges and food grade orange oil. We had no orange oil and the blood oranges were lovely but fairly tasteless. Turning those oranges into an ice cream ingredient does not improve the flavor. Punt! By the time I discovered the deadness of the blood oranges, I had already assembled some pretty dear ingredients in the mixing bowl. More than that, we had our taste buds ready for orange ice cream. As a result, besides the orange zest, I added chopped candied orange peel, a splash of citrus-y Triple Sec and a tablespoon of the syrup left from making the candied orange peel. (Yes, you can make your own). Having gone into creative mode, I now decided that a bit of shaved chocolate would be a splendid addition to the ice cream. It was! The acid test in evaluating this recipe came when we fed the ice cream to Matt and Cody who had been burning tree prunings, part of our wild fire preparedness. These two guys are not ones who would order olive oil ice cream at the deli. When they were almost done, we told the guys about the olive oil. They were stunned! The were especially stunned about the amount of oil in the recipe. Cody has an ice cream maker and a serious interest in making this ice cream for himself. Did this recipe pass with flying colors? Indeed! For the load of food value in this ice cream, none of us felt the discomfort of having over-indulged but it was a number of hours before anyone considered eating again. Talk about stick-to-your-ribs! In a large mixing bowl whip up the egg yolks and mix in the honey until the honey and yolks are totally blended. Slowly add the milk as you continue to mix. Add the cream, orange zest, Triple Sec, salt and syrup (syrup’s optional). Mix well. Taste for sweetness and salt. Make any necessary adjustments. Stir in the chopped orange peel. Place the mixing bowl in the freezer for an hour or two to get a jump-start on the ice cream making. Stir it up every 30 minutes or so. During this chilling time the candied orange peel begins to release flavor into the mix. A good thing! Run your ice cream through your ice cream maker, following instructions in the owner’s manual. When the ice cream is done, spread it out in a large container (e.g., glass pie plate) that has been sitting in the freezer for this occasion. Nothing melts your newly cranked ice cream like putting it in a room temperature container. Sprinkle the grated chocolate over the ice cream surface. When you are ready to scoop the ice cream, the chocolate will appear as a swirl rather than a total mix of chocolate bits in the ice cream. Call me picky! I just like the look of that. It seems more planned and artistic. Call me opinionated. You’re right! Place the ice cream container in the freezer for another hour or so to really firm it up. The oil and the Triple Sec will keep the ice cream from turning into an immovable brick, easier to scoop, creamy to eat. 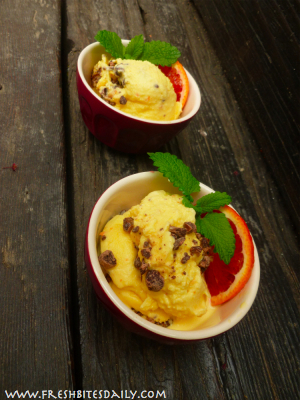 Scoop the ice cream into cold bowls and garnish with orange slices and mint or lemon balm. Do enjoy! This stuff is amazing. 3 Comments on "Orange and Olive Oil Ice Cream"
Olive oil on ice cream since an interesting one to try. I can’t imagine yet what would my reaction would be on the first taste.